Why Do I Have to Hold Down the "Fn" Key to Get Normal Letters? - Ask Leo! Why Do I Have to Hold Down the “Fn” Key to Get Normal Letters? Computer manufacturers use the Fn key to cram more virtual keys onto smaller laptop keyboards. Sometimes it can get confused. As i type right now, i have to hold down the “Fn” key just to get normal letters. I don’t know how it happened, but I’m on a laptop and the only way for me to get the “u,i,o,l,;,k,j,m,7,9,0,/,p” keys are to hold down the “Fn” key. It is purple on the lower left of my internal keyboard. One of the compromises laptop manufacturers had to make to support a full-sized keyboard into the space of a laptop is the numeric keypad most keyboards have. What they’ve done is overlaid it “on top” of the regular alpha numeric keyboard. The trick, of course, is noticing it, and then turning it on — or in your case, off. Here’s a shot of my laptop’s keyboard (please ignore the dirt — it’s a well-used and well-traveled, machine). Down in the lower left, you’ll see the “Fn” key that we’re talking about (though mine’s blue instead of purple). That layout of blue characters mimics the layout of the numeric keypad on a full-sized keyboard. 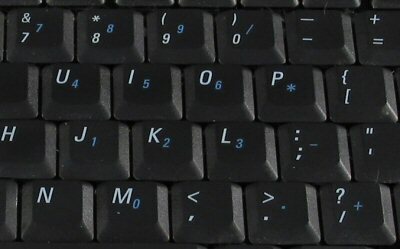 Normally, if you hold down the “Fn” key, you’ll get whatever character or function is printed in blue on those keys. So holding down the “Fn” key, you now have a numeric keypad in the middle of your keyboard. Release “Fn” and things are back to normal. Which is exactly the opposite of what the questioner is asking; they need to press the “Fn” keys to get the normal (white) characters for each key. The “problem” is simply that there is a persistent toggle. If you press “Num Lk” (I’ve also seen it labeled “Pad Lk” for numeric Pad) it turns on the blue keys, and inverts the meaning of the “Fn” key — it’s a way to use the embedded numeric keypad without having to hold down the “Fn” key the entire time. To fix it, just find and press “Num Lk” or “Pad Lk” key again. (Note: sometimes these keys are themselves “Fn” keys, so you may or may not need to also hold down the “Fn” key to get the right function.) Often there is an indicator light associated with the setting. Help! My Shift key is stuck! - Windows has an accessibility feature that's very easy to turn on by mistake that changes the behavior of your shift key and others. Can I Use an External Keyboard with My Laptop? - Go ahead. Plug it in... unless your keyboard is not USB. In that case, you may have a problem. Why Doesn’t My External Monitor Work? - You plug a new monitor into a laptop with a broken screen and still can't see anything! You may need to tap a few magic keystrokes to turn it on. I Can’t See the Top of a Window, so I Can’t Minimize, Maximize, or Close. What Can I Do? - Sometimes windows can inadvertently be positioned off screen where your mouse can't reach. The keyboard interface, on the other hand, most certainly can. « Previous post: How can I automate an SFTP transfer between two servers? Thank you so much..lol I am still holding the Fn key while writinng this….btw thanks so much ……. OMG!! THANK YOU!! I spent the entire day and night yesterday googling this issue with no luck! I was going “crazy”!! If I didn’t find your Help today I was going to have to bring it to the “Geeks”. Thank you, Thank yo, Thank you!!! Thanks for the help. I don’t know why the num lock was on after a reboot wasn’t before today. I am leaving on a trip tomorrow and was afraid I was going to be with the use of my laptop. I opened a help desk ticket, well see if my IT dept. can help. I will give them a couple of days and then give them the answer. I pressed fn then scroll number lk while still holding fn and it worked. Make sure your number lk is turning off. If it isnt, then try one more time. Don’t press them at the same time. Press fn, hold it, then press number lk while still holding fn. That worked for me. I just plugged a numeric key pad to be able to type the numbers faster. Unfortumately, you have to turn on the numlck for that. Is there a way to use the numeric key pad and the keyboard at the same time? If possible as well, can you email me the answer. I appreciate it! Hello, thank you so much :S I was freaking out, it’s ironic because before that I could never do work the Fn keys, it was like a heaven’s call telling me: “well, do you want the FN working huh?” and then I oculd write well… Thanks for the help!! i had the same problem, except i had to press SHIFT and NUMLOCK to fix it. i was stressing cuz it was very hard to type. this is for converting the blue keys in to NumLock and take them back to normal. But I am using a Compaq laptop, while I press Fn Key, the blue keys are typed, and when I release the Fn key, I can type the normal keys. This is a very great tool for me. But sometimes for some unknown reason (maybe I press some key wrongly) this tool is gone, and I can not get it back until I run the Windows restore system tool. Could you please show me a way to get it back noramlly, perhaps by pressing a combined sets of keys??! HELL YEAH!!!! Awesome.. I’m a tech at a college and had the whole dept. stumped, we have a shitload of these laptops and it was happening left and right… no way.. how easy was that? Awesome.. I’m still so excited that I found this answer.. I’ve been searching for months for something, on the internet, called the computer store we purchased them from… no one knew… thanks a lot. You saved us a lot of money. We were ready to get at least 8 new keyboards. Thanks again. Thank you, so much. I thought I was going insane. I recently got a windows laptop, and I’m a mac junkie, so thank you for saving me the disgrace of taking this into a shop, haha. HEEEEELLLP!!! My Compaq Presario Fn problem is similar but it seems THE FN KEY DOESN’T WORK AT ALL. I press it over and over trying to release [something]and only get the numbers and no letters. Have tried pressing the Number Lock but it doesn’t help. Thanks so much – this was driving me crazy & it’s now fixed – thanks to you! Thanks!! This has happened to me more than once, usually after a child has got a hold of my laptop! Now I know how to fix it, and how to use the blue keys!! I have had my laptop for a year but this “fn” has never happened to me. For two days I was wondering how to solve this mistery until I came to this website. Thank you for your help. This helped a lot. Whenever I logged onto a laptop from a domain I could never use the keyboard as I had to hold the key to get certain letters although other users didn’t have to. Now I know why! Thought it was a problem with the profile settings. Thanks a lot! thank your for this site, never would have figured it out on my own! Thanks a lot.!!!!!!! I had to replace keyboard for my laptop some days ago and I was really disappointed that some keys only worked when I was holding down they Fn key. I was about to return the new keyboard and solution you gave me was so simple, Thanks again. Could not thank you enough for the tip !. I was worried if i did something to the laptop…!! damn…the lenovo.com , ‘great’ sites did not even mention the subject !! Thanks! I had the same problem just now concerning the Fn key and after reading your article I was able to solve the problem. Simple but fix but very difficult for those of who don’t know the simple fix. Thanks i was trying for hours but couldnt find a website that had this question. Thanks. I have the same issue. It has now been fixed.. I need to hold Fn key ,while press Num Lk to unlock it. Call me stupid, but your site helps me out greatly. Thanks! omg thank u been like months couldn’t figure this damn thing out thanks . by holding the fn key and then f9 or pad lock i did it! Thanks a lot… ur like god in need… IBM itself has no information to turn off fn key…. it wasted my 2 hrs…. Lastly i could find it here.. This trick was great i thought that i had to replace my laptop keyboard!!!! Hi Buddy, thanks very much. You are a don. Cheers!! I updated to Windowsxp sp2 and i use the the login so when the window pop up for me to put the pw i couldn’t type any leter j, k. even i tried that numlk. If i press the fn key and or the shift key i can’t type any letter. so any idea??? cheers bru, was starting to tear my hair out..! The Compaq heldesk guy did not know wht he was talking about when he was helping. Wasted my 1.5hrs…..and got to work late as well. The next day i found the solution here and was fixed in sharp 6mins. Leo ur genius. You da man!! Thanks, I was using an external mouse, and the ms on screen keyboard. I num locked the on screen (entering a lot of #’s) when finished I removed the mouse and couldn’t get my laptop working right ’til I found your site. You da man!!! Leo, sorry, but my question did not get answered and am still struggling with how to eliminate the light off icon when pressing Fn and PgUp where the light icon is. Sometimes when I do use those two keys together, it will disappear, but not always. Any suggestions, please. Thank you for explaining the problem and solution so well. It is exactly what I am looking for. I use an external mouse and keyboard. when I activate numlock, the keyboard works fine and types a number. when I deactivate it types letter, right all is OK. /but now: I hold the function key and then type “j” to get 1 instead the notebook sees it a directional or arrow key. How do I fix this. When I have a external keyboard I press numlock twice and the problem seems corrected. But I do not carry a keyboard along the whole time. Thanks! I’ve been trying to figure this problem out for a week. Worked like a miracle. Thanks a million, mate! THANKS!!! I’m so glad I found this article. I didn’t know what was going on. I was just getting ready to take my Compaq laptop to the shop as I couldn’t figure out how to unlock the function key (lost manual). Your solution was right on. Can’t wait to read your newsletter. Thank you. Thanks for the information. M being displayed as a 0 was driving me nuts. Based on your explanation, I was able to turn Fn off. Thank you!!! I am so glad I googled my problem and your page came up. I had been sitting here with Windows help for 2 hours and did not come close as to how to fix my problem. MY KIDS ARE NOT PLAYING THERE GAMES IN MY LAPTOP AGAIN!! My gripe is that I can’t figure out a way to get the special characters that I used to get when I typed something like alt + 0186 to get the degrees symbol, etc. Is there any way I can type these symbols without having to use the character map, please? I’ve tried all sorts of key combinations but no luck. blue numeric keypad embedded on my keyboard. Thanks so much. I just googled “Fn key” and yours was the first hit. I have spent over an hour discovering all sorts of setting on my laptop that I didn’t know about, but none of them fixed the problem. It was so simple – I’m glad I didn’t take it to a Pro to be fixed – I’d have felt such an idiot. (Thought my laptop was on its way out – it’s quite old now). I had the very same problem for a while, and I couldn’t figure out what to do. This was very helpful. Thanks! and before my computer mad son and hubby too!! Sounds like a broken keyboard. Get it repaired. i tried again and it worked. this time i pressed shift at the same time as numlk. thank god for that!my dad wont be cross now. thankyou so much, you have given me a good excuse to carry on with my homework! lol! you are the best and i will recommend this website to all those with pc problems! After working on this damn thing for over 1 day, it came to me to run a search. Duh!! The worst part of the entire situation is I work on these silly technological blunders. I love you…. so much.. thank you. My cat just walked on my keyboard. I was able to Google “Fn”, then pick “Fn key” from the related topics and found you. Thanks!!! oh my gosh. thank you so much. i thought that my FN key got stuck in reverse or something. this is embarrassing for me too, because i work with computers as a profesion.. Your article has been very helpful, had the same problem with my laptop. Am getting normal keys again. Thanks a lot! THANK YOU!!! This has hapened to me before and had no idea how I turned it off!! I’ll keep this in my memory bank! You are my hero of today! Couldn’t find anywhere how to turn it off again. thanks; had the same issue, due to a cat; solved now with your help. I had no idea that num loc switched on the fn key – couldn’t work out what was happening. thank you, so simple when you know how. I was going crazy with the Fn key. thank you so much ,I think it was afualt on my computer. Thanks Leo. I don’t have much more hair to pull out. MAN! Thank you very much…that’s all have to do. Great stuff* Thank you for that brilliant article! One minor thing worth mentioning. Maybe put the solution straight after this sentence. And then give a detailed breakdown of the FN and related keyboard functions. Thanks, pressing Num Lk fixed the problem. Very useful link! Thanx a lot! I had the same issue for many days…now solved! Once I thought my keypad is malfunctioning, and is going to cost dollars. So glad to find the answer. i have to assume that my cat turned the Fn key on as she likes to walk on my computer while I type. Thank you sooo much, this has been driving me crazy. I let my three yr old play on Disney and the next time I try typing I find that the Fn is stuck, what a pain. THANK YOU!! Hey, thanks a lot for the article, could you maybe also help me in the case, that my “num lk”-key is not working. is it possible to disable the fn-keys at all? Thanks, Leo. You are a lifesaver! I’d been to Microsoft’s page and they wanted to charge me $60 to ask a question. That’s crazy. It seems like they could put that type of information into their help menu (where I’ve been searching the past week). Leo, you’re great! BTW-my fiance’ is named Leo, too. It must be code name for great guy! Thank you for this information. I too did a search for the “fn key” and did not get answers via my computer help search field. As soon as I typed fn key in a google search, your page appeared and help with an answer quickly. THANK YOU SO MUCH! It was driving me crazy. Y. Thank you Leo. I can’t for the life of me understand why Sony haven’t put those instructions in their manual along with the other function of the Fn key, ie, to alter the volume, brighteness & contrast, etc, when used with the normal Function keys (F2, F3, etc). Now I’ll have to suss out which keys to activate to type characters such as the degrees symbol and French accents, etc, that I used to do using codes, such as Alt+0186 and Alt+0233. Thank you so much! This problem was driving me crazy. I tried every combo that I could think of. I even had a computer tech look at it. I held down the fn key with the scroll key and that cleared it. I am glad that I can type this without holding down the FN key! Thanks again! I am trying to turn off the FN key so I can type on the laptop, however I do not have a number lock key or the other key you were speaking of, what should I do. it is a tablet PC addition of a laptop. My problem is that the number NOR the letter won’t type. I am logged out of my computer now so I can’t even log in and I don’t know what comes up or not. with the documentation or the manufacturer. Thank you for this! I borrowed my husband’s NEW laptop and immediately “broke” it (disabled the Fn keys). Now, thanks to you, he’ll never know. Muhahaha…. I had the opposite situation; I needed to use the numeric key pad and couldn’t figure out how to get it to work. I googled the question and your information was absolutely perfect. Thanks. I do not have a num or a pad lock key. I tried the fn and the f11 keys but that did not work either. I have a Gateway laptop. Can anyone help me? For GATEWAY users, the numlock key is on the scroll key and looks like a padlock with a ‘1’ in it…i.e. ‘number’ ‘lock’. Cute but a pain in the …for those of us without an imagination or looking for something else, but for small keys, a symbol is easier to fit than several letters I guess. Anyway, thanks for the tip and it worked for me! My problem is why is the keyboard backwards locked since I installed a wireless keyboard? I shouldn’t have to use num lock to use the regular keys in the first place. I was happy to find this website, but your answer doesn’t seem to work for my laptop. I have an HP that I just bought in Sept/09. I have more of those blue keys than your keyboard, Leo, but your suggestion doesn’t work for my computer. I dont’ know which keys I accidentally hit to turn the blue keys on, but all of a sudden they are on and I can’t turn them off unless I restart my computer. I think I’m turning the blues on with a mistype using the caps lock or shift keys, but I can’t figure it out no matter what combinations of keys I hit on purpose. Help! Thank you soooooo much it has been driving me mad. I knew it was something I had pressed but could not remember which key (it should have been the screen dump PrtSc key). You have saved me hours of frustration – thank you again. thank you so much – i was loosing my mind trying to type holding down the fn key. Phew – such relief, thanks Leo!! Finally!!! After a couple of hours of research I found the solution to my problem!!! Thank you so much!!! Detailed, informed,invaluable a big big thank you. Keep up the good work sharing the knowledge and making many people very happy..
I’m closing comments on this one, simply because so many are nothing more than “Thank You!”. You’re welcome. my net book special keys on, but my need suggestion how to off special keys. asus netbook-Eee pc seashell series. my PC have no NUM LK . when i press Fn+F11 this problem is solve temporarily. but some time after restart PC this problem start again. and every time after windows set up this problem start. now what can i do for permanent solution? It was very much helpful as i was also having the same problem…. Thank you so much! I was so scared, and going through a lot of difficulty with this; I had no idea of how simple the solution was. i love u man, u just save my life, thank you man for sharing this soloution, i having this problem in months and my language is farsi, until today i searched in english and your web site show up, god blessed u. Unfortunately this fix does not cure my problem. No matter what keys I press, the letter ‘u’ makes my cursor step back and ‘p’ is an asterisk etc, etc. It just started for no reason. If I connect a USB keyboard, it’s fine. I’m stumped. Might be a damaged keyboard. I believe this would be the Scroll Lock Key doing this !!! Since it was taken from an image it could have been driver related, but nope. Re-updated them. Thanks so much!!! Its been a year already i cant figure out how to type normally on my samsung notebook. I dont even want to use it anymore but now i can bring my samsung notebook anywhere i go. Thanks a bunch!!! Just purchased a genius i200 for work (Debian OS) and was going nuts remembering when to press the function key to get “regular” keys to work without the function key. Was just deciding that I had chosen poorly and buy something else, but with your helpful advice, I’m a happy keyboard user = again! Try “Shift, Control & FN key at the same time. should work. I’m very thankful to read some comments and messages in fixing the problem and I tried to search the same problem that I encountered but I didn’t see a similar case. Can you please help me solve my problem for my asus notebook model transformer t100 with OS windows 8.1, because yesterday I experienced some key problem in my laptop,once press some letter such as L or M my laptop might be switch off. I tried to restore or reset keyboard settings but nothing happen.. Thank you and your comment is really appreciated.. THANKS ALOT! I PRESSED NUM LOCK AND MY KEYS ARE NOW WORKING PROPERLY. THE ONLY CHALLENGE I HAVE NOW IS WITH MY SPACE BUTTON, LETTER “B” AND LETTER “N” KEY. Thank you Leo! I brought my computer to a repair place that charged me $200 to change the keyboard, which wasn’t (and didn’t solve) the problem; it was this (I got my money back and sent them your article for future reference). Had similar…tested the keyb by booting Linux, but same result. Test was seeing if Windoze was prob. either driver or keyb subsystem. Saw your post about fn numlock combo and it worked !! Was wondering if the keyb internal mappings were flushed, or similar explanation !! Thanks so much. it worked. holding down the fn key and pressing the num lk turned it off. thanxs friend i am totally disturbed with this problem about 2 months. thank you so so much…. while typing this comment my fingure automatically goes for fn key… bcoz am facing tis problem fr last 2years…. LEO YOUR THE BEST……. you saved me from spending my little cash. A Nigerian common saying to appreciate wonderful men like is ” you be correct guy”…. so have it —-> “Oga Leo na you be the most correct guy”.. really cant thank you enough. Thank you!! i somehow activated the Numlk key without my knowledge and all of a sudden i was getting the numerals! I almost wiped out my centOS installation running on a VM thinking its all screwed up!! I can’t find ‘num lok’ key? fn does let me use numbers, but I have to hold it down to do that. your explanation with the numlok sounds good, but I just can’t fine numlok key……. help ! Thanks a lot been using an external keyboard for a year because I was too lazy to look it up. i was getting so frustrated with the numlk on. Since the last window 10 update i cannot use the space bar without holding down fn key and can’t use the arrow keys either and shift keys. Hi! Whenever I press Fn+NumLk the Numpad in the laptop keyboard deactivates… However, the “u,i,o,l,;,k,j,m,7,9,0,/,p” keys still won’t work and I have to press Fn to get those characters. Help, please! Thanks for helping me solve an annoying problem with such ease. I thought my little notebook was starting decompose. I just love how you explain things in simple terms. You are very good at it. I use your site very often. Thank you, this solved my problem, your awesome. I am having similar issue cannot use space bar without using FN or use any other key that needs FN. ie 1, 2, 3, 4 or special characters Above those keys even Shift does not work either. It did not work for me. Same problem but I DONT HAVE NO FREAKING NUM KEY ON MY LAPTOP!!! Thank you! Just bought a tablet PC and I was afraid it was a manufacturer defect and I already have had to return one tablet already due to a defect and it’s the week after Christmas so half people in the city are in line at store return stations. Thank you so sooooooooo much for this valuable information… You’re really a life savior!! thank you so much for this post. For the past couple of days i was so frustrated while typing my keyboard as i had to press function key while typing j, k , l , m and others. After going through your post i was able to resolve this issue.